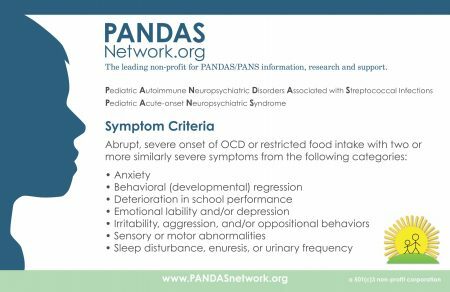 PANDAS, or pediatric autoimmune neuropsychiatric disorder associated with streptococcal infection, is an autoimmune condition that produces psychiatric symptoms that appear suddenly following a case of strep throat in children. These symptoms can include obsessive-compulsive symptoms, tics, and behavioral dyscontrol and regression. Treatments are still experimental, but those that target the immune system are expected to be most successful at improving PANDAS. In 2015, Miro Kovacevic and colleagues published a case series describing the use of intravenous immunoglobulin treatment (IVIG) in twelve children with PANDAS in the Journal of Child and Adolescent Psychopharmacology. One or in some cases two injections of IVIG brought about long-term remission in the children with PANDAS. IVIG consists of a wide range of antibodies from multiple individuals delivered via injection. This increase in the quality or quantity of antibodies in the recipient is thought to suppress the production of antibodies that attack brain cells, causing PANDAS. The case series was based on patients at a large clinical practice that specializes in the treatment of PANDAS. The practice used a dosage of 1.5g/kg divided into two daily doses of 750 mg/kg, meant to match twice the volume of the patients’ own immunoglobulin G.
IVIG and other anti-inflammatory approaches are also effective in PANS, a more general variation on PANDAS in which psychiatric symptoms occur following an infection other than strep.